I have a lot of magnets on my fridge. Maybe too many (although I secretly don't think there's such a thing as too many magnets). It's the one area of my house where I express my hoarder fantasies. My fridge: a colorful collage of magnets, doodles, and stickers. 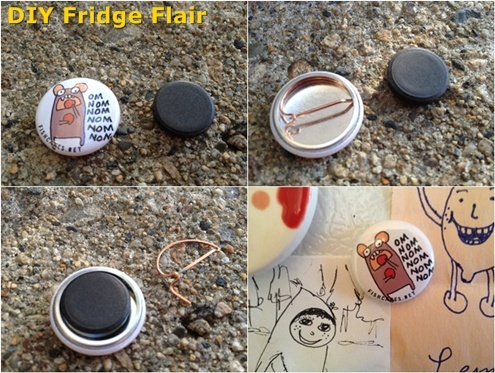 If you love fridge flair as much as I do, you'll love this easy trick for making hip magnets. A small magnet. I've saved a stash of magnets from the bottom of vinyl shower curtain liners. 1. Open the pin and pull out the wire, pin part. 2. Place the magnet inside the pin. 3. Draw something (how about an ICAD?) and post it on the fridge with your new fridge flair. You're a star! How many refrigerator magnets do you think are too many? Do you prefer a totally clean fridge front or do you love expressing yourself via your appliances? p.s. - I left you a lil voice message in return. I hope it worked and you got it! Awesome! I'll look for the voice message in my inbox.